Support Widgets allows you to create your own customizable In-Website widgets that can be placed in any website of your choice. The widget can be customized to pre-fill form data and show custom text. Also, multiple such widgets can be created. Raise new HappyFox support queries using the information provided in the form. Search/browse your Knowledge Base articles prior to raising new tickets. Log in to your HappyFox helpdesk. Go to Apps >> Goodies >> Support Widget. 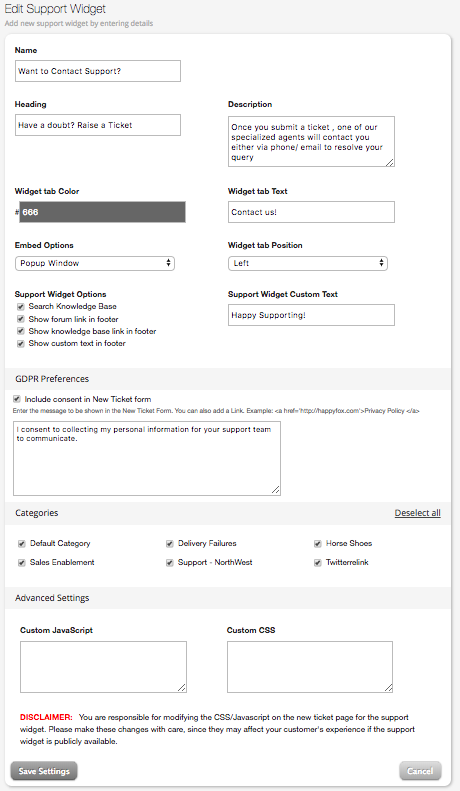 Click "Create a Support Widget". Provide the name, heading, description, Widget tab text, Support Widget Custom Text, Widget tab positions, Embed options and Support Widget options. Specify a color for the widget tab. If GDPR compliant, choose to ask for consent from customers by enabling the checkbox. Associate the categories you would want the tickets to be created from the widget. In the advanced settings, specify any Custom JS/HTML. Click "Save Settings" to create the widget. 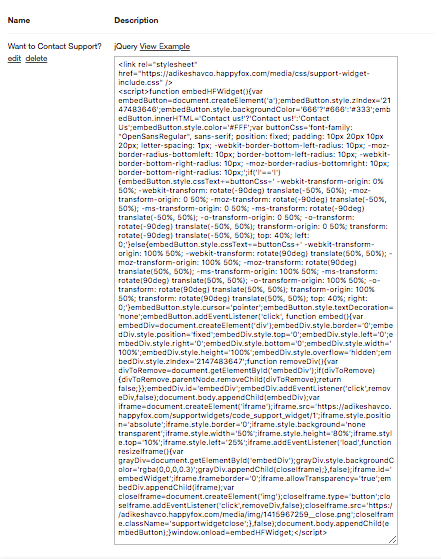 In the subsequent screen, Copy the JQuery code snippet, and paste it on your website's code. You may choose to preview your widget in a sample website if needed. phone=<value> - Phone number if the field is enabled. hide_contact_info=true - This will hide the name / email / phone fields from the form. category=<value> - Will select the category. 1) What is Name, Heading and Description? Will my contacts know about this? The name is an internal reference within your help desk. In case you manage multiple websites from the same help desk, you can use Website A support form or Website B contact form as the names of the form. The heading is the text that will appear when the form is opened by the contacts. You could provide some instructional text in the Heading and Description fields. 2) Why should I associate with categories? In case you want your contacts to have the option to submit to different categories on your help desk, you can choose the relevant categories. If only one category is selected, the drop-down will not appear and the software will submit the requests to the selected category, by default. 3) What customizations are available for the widget tab?